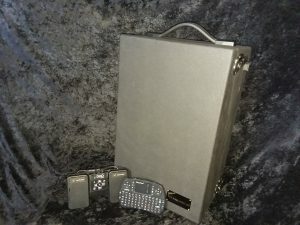 The Wolfgang TELEMONITOR® is THE first commercially available and affordable teleprompter manufactured in the USA with musicians specifically in mind. We have been around serving musicians of all sorts from acts that perform 4 gigs a year to international touring acts with upwards of 240 shows worldwide. Our customers are 18 to 82 years old and we have been building THE Wolfgang TELEMONITOR® SINCE 2009. Call us toll-free at 800-841-9960 for more information or to order one of your very own today. We have several models that come pre-loaded with SetList Helper. 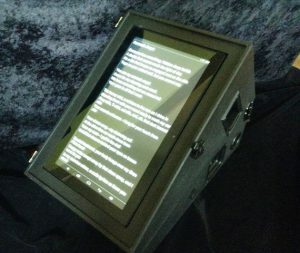 One design incorporates an 18.5″ Touch Screen tablet or a 22″non-touch Monitor in a sleek wedge meant to be stealth on stage – Wolfgang TELEMONITOR® Wedge. We also recently introduced a product that you can carry-on to airplanes to bring your device with you. We call it the Wolfgang TELEMONITOR® Air, it can be equipped with an 18.5″ Touch Screen or a 19.5″non-touch Monitor. To the left is our wedge product ready for the show. Here is another shot of the Wedge ready for transport to the next show, shown with the included accessories. 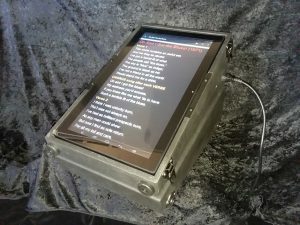 All our Android TELEMONITOR products come with a wireless keyboard, an AirTurn 2 pedal footswitch and SetList Helper Installed. 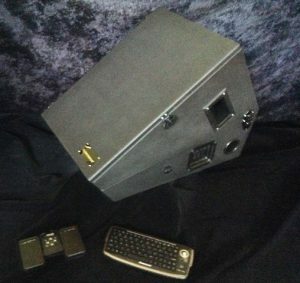 Below are a few pictures of our Android Wolfgang TELEMONITOR® AIR products to give you an idea what they look like. Prices start at $899 with free shipping in the Continental 48 Contiguous United States (there is a charge for shipping to other locations). We ship them all over the globe. To the left is our Wolfgang TELEMONITOR® AIR with its included accessories, and as you can see it will fit in the overhead or under the seat in front of you quite easily. Here is a shot of the Wolfgang TELEMONITOR® AIR Touch set up and ready to provide assistance to you at a show. It only takes a few minutes to set it up. If you are interested in finding out more information on these products or how to order them, visit our website, or click here to be brought directly to Wolfgang TELEMONITOR® Website. Visit our website to find out more about all of our products, pricing and how to order one. You can also contact us at 800-841-9960, or send us an email to be_a_star@msdminc.com We have plenty in stock and you can have one of your very own. © 2009 – 2018 Main Street Dream Makers LLC. All Rights Reserved.